There are several reasons why you should consider attending church: For spiritual guidance, to worship, for fellowship and more. But did you know it’s good for your health? Studies have shown that attending a house of worship is good for the health of older adults. Science cannot entirely explain why these health benefits occur, but that shouldn't stop you from discovering for yourself. Studiesshow that attending services helps reduce stress, which has many health benefits, including improvement in blood pressure, mental health and preventing chronic disease. It might not seem like it, but more than 50 percent of Americans attend church services once a month. So, should you attend church? That’s your call. But it can be healthy for you. Reasons for attending services in a faith community can help older adults. 1. It can make you mindful. Mindfulness, usually associated with meditation, which also has a place in a religious service. When you’re mindful, you’re focusing on what’s happening at that very moment, not yesterday or tomorrow. It can be difficult to make ourselves focus on the here and now, especially if we’re going through a transition as life-changing as addiction recovery. But taking even a few minutes a day to be mindful of all we have in the present moment -- and especially all we have to be grateful for -- can help us feel more at peace with ourselves, our surroundings, and our circumstances. Studies have shown that attending services can give you a better outlook on life and illness. By boosting your mood, it is setting you up positively for the rest of your week. Older adults often experience isolation when they move into a retirement home, feeling lost without their home and family. Attending church can get you out of the house and into a social setting, making you feel better. 3. It can help you live longer. Some studies have shown that those who attend church or synagogue live longer than others. One possible reason is the reduced stress, as mentioned above, but another theory is that the effect of religiosity has protective benefits to the heart. It can also help you live longer if you believe that your life has meaning, and who doesn’t want that? 4. It gives you a community. We all have various communities in our lives. Work, home, neighborhoods and more. A faith community can be there for you when others are not. Senior adults benefit from having a community to depend on when they need it. Communities also get you out of the house and engaged. You can attend social gatherings, card groups, knitting or crochet groups, exercise classes, Bible or Torah study and more. Being surrounded by other people and just having someone to talk to can make your life better in meaningful ways. 5. It can give you a purpose. A faith community can get you involved in volunteerism and social justice, which take you out of your own needs to help others. The feeling of being needed or that someone depends on you can be an excellent boost to your self-esteem and a sense of purpose, giving you a specific reason to get out of bed in the morning. No matter where you are at in your walk with God, we invite you to experience the numerous benefits outlined above. You’ll likely feel fresh and recharged for the following week, and hopefully better able to take care of your health. Your body will thank you. 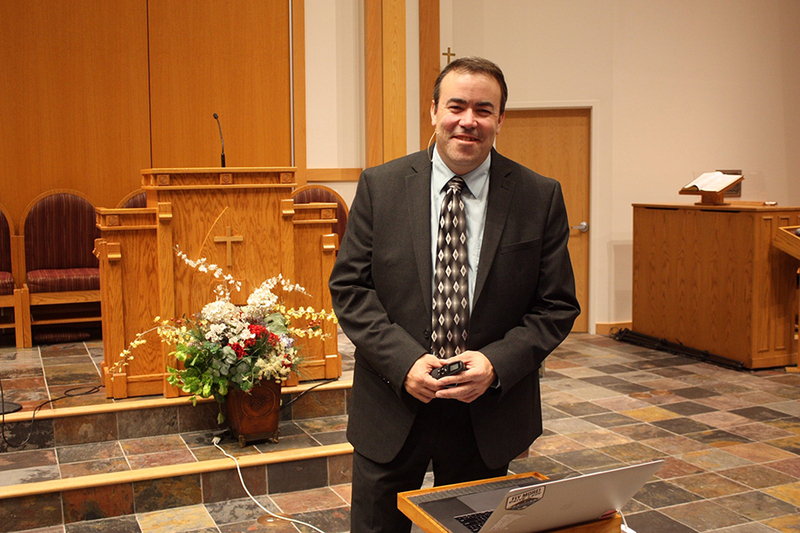 The St. Louis West County Church hosted their third annual community Health Expo in April. The Health team, chaired by Lauren Clark Thompson and Leslie Olin, invited a variety of health-focused businesses to share information and interactive displays with participants. A local optometrist offered free vision screenings, Barnes Jewish Healthcare gave cholesterol and blood glucose tests, and Excelsior Family Chiropractic gave spine screenings. Using the eight natural laws of health principles from the NEWSTART Lifestyle Program, interactive booths provided information on Nutrition, Exercise, Water, Sunshine, Trust, Air, Rest, and Temperance. Other booths offered information about health counseling and using whole foods as medicine, and Monarch Fire Department made fire trucks available for children to explore. Healthy food samples included Black Bean & Chipotle Burgers, Hearty Vegetable Stew, and Edamame Salad. Guests were excited to learn the Health Expo is an annual event. One even said she was going directly home to place next year’s event on her calendar. Learn More about these exciting Health Expos by Clicking Here! Matthew and Michaela Lawrence were baptized by their grandfather, Thomas Knoll. (Photo submitted by Rebecca Lawrence). Matthew and Michaela Lawrence, brother and sister, became the newest members of the St. Louis West County Church on April 28. 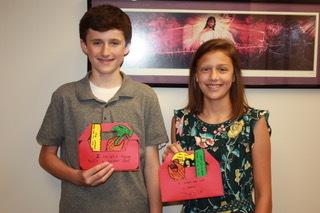 Matthew (13) and Michaela (9) are the seventh consecutive generation of Adventists in their family. Their grandfather, Thomas R. Knoll, Sr., an ordained minister, had the pleasure of baptizing them. Their grandmother, Merry Knoll, played a special role by sewing their robes. Matthew and Michaela’s parents, Jay and Rebecca, said the children love Jesus and are excited to officially become members of the Adventist Church. 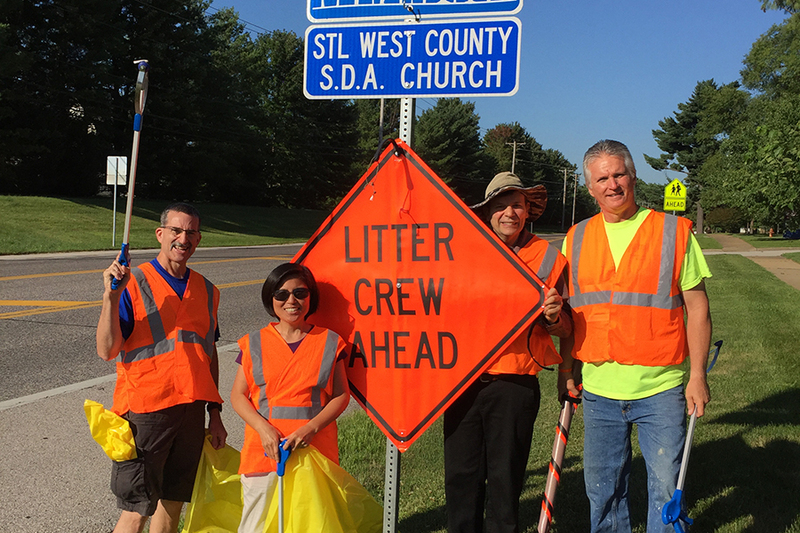 West County Ministries are working together. 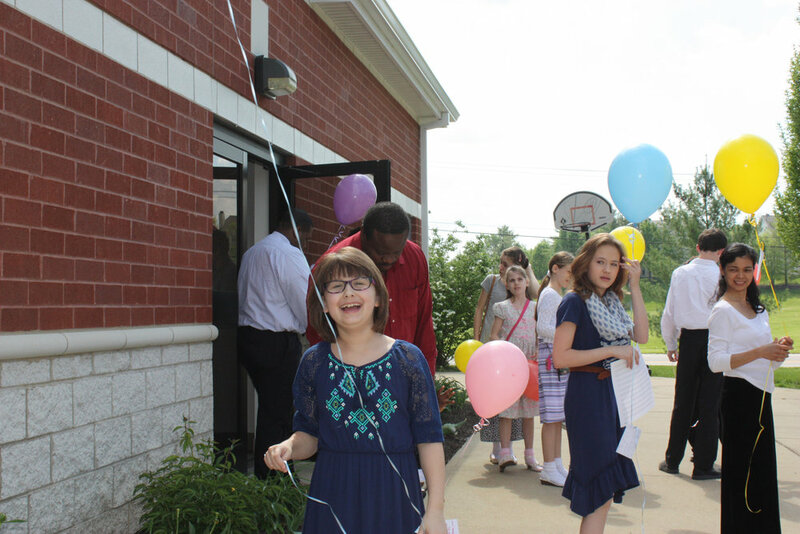 One way is through the Sabbath School Department hosting “Invite a Friend to Sabbath School Day”. 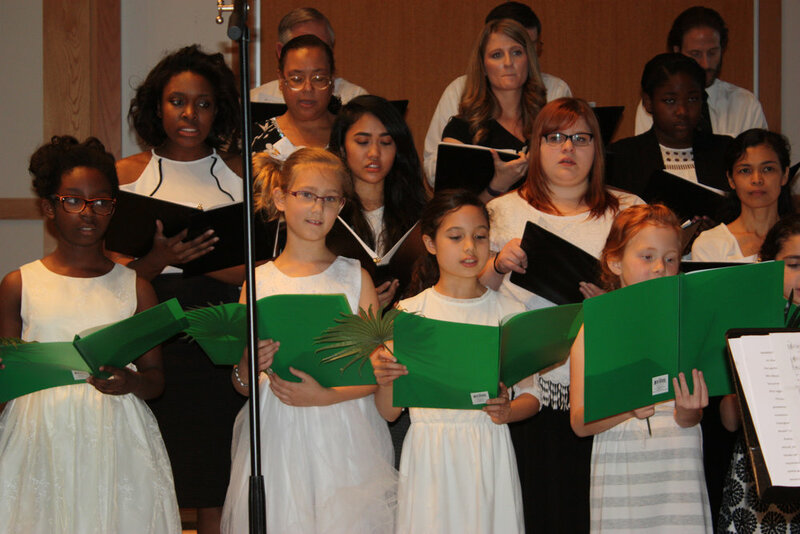 Here the Sabbath School partners with other Church Ministries to invite friends to church for exceptional programs like the Easter and Christmas Concerts (provided through the Music Ministry) and the Family Weekend (provided by the Family Ministry). The Hospitality Ministry hosts everyone’s favorite Fellowship Meals on these “Invite a Friend to Sabbath School Days”. Pray: pray for the Church Ministry’s and those attending these programs. Invite: give out invitation post cards to friends (provided by the Ministry Council). These cards can be personally given or add a short note on the back, address and then mail. Attend/Participate: please come, join in! Never underestimate the value of your attendance. Bring a dish, stay and socialize, visit with old friends and establish new acquaintances. West County Church begins their Picnic in the Park season in May, visiting a different park each month through October. Many comment on how much they enjoy getting acquainted with the different parks that we visit. Each year we add in a new park along with our old favorite ones. There is a common denominator that hits the target every time, and that is - yummy food! Everyone brings a favorite dish or two for this potluck style meal. These relaxing meals in nature are enjoyed by all ages; a time for making new friends, catching up and renewing acquaintances. Purina Farms has become our annual first picnic stop and it is always a tailgate lunch on the lawn before visiting the barn and dog show. Our next picnics were all under protected shelters at Longview Farms in June, Bernie Park in July, Love Park in August and Queenie Park in September. Our last picnic will be on October 28 at Babler State Park, remember to bundle up, with the weather being cooler and then enjoy the extra warmth at one of the four stone fireplaces. God is sovereign—He is the supreme authority over all things—but He has chosen to work through men and women. I would describe the partnership between God and man like this: we can’t do it without God, but He won’t do it without us. We are not to be independent of God, thinking that we can accomplish His will without Him. Jesus put it this way: “Without Me you can do nothing” (John 15:5). God on the other hand does not “need” us, but He chooses not to work on earth apart from us. His plans include you and me. They factor our obedience, walking in partnership with Him. If you haven’t already asked God to partner with you on a SS Investment Project, there’s still time. He is waiting to hear from you. 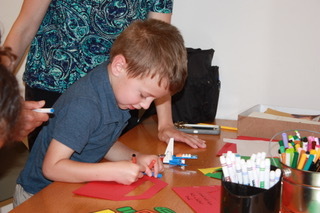 On June 17 the children took turns during their class time to visit the Sabbath School resource room where they each hand crafted cards for Father’s Day. The exercise encouraged the students to recognize the things they appreciate about their Dad’s and the importance to take time to thank them! There is honor in the aging process, as growing old is normally accompanied by increased wisdom and experience. “Gray hair is a crown of splendor attained by a righteous life” (Prov. 16:31; Prov. 20:29). You are invited to celebrate the legacy and contributions of older adults to our church and community, and join us lunch on Saturday, May 27, 2017. 9:30 am - Song Service and Bible Study. 10:45 am -Worship Service. Noon Family Friendship Lunch. Give invitations to your family and friends. Bring an Older Adult to share in the celebration. We anticipate having many visitors, so members please bring plenty of food to share. Do you know what a May Basket is? Many students learned today for the first time what a May Basket is, a tradition of secretly placing a basket, often handcrafted, at a neighbors door, then ringing their door bell and running away so the neighbor wouldn’t know who the good deed was from. 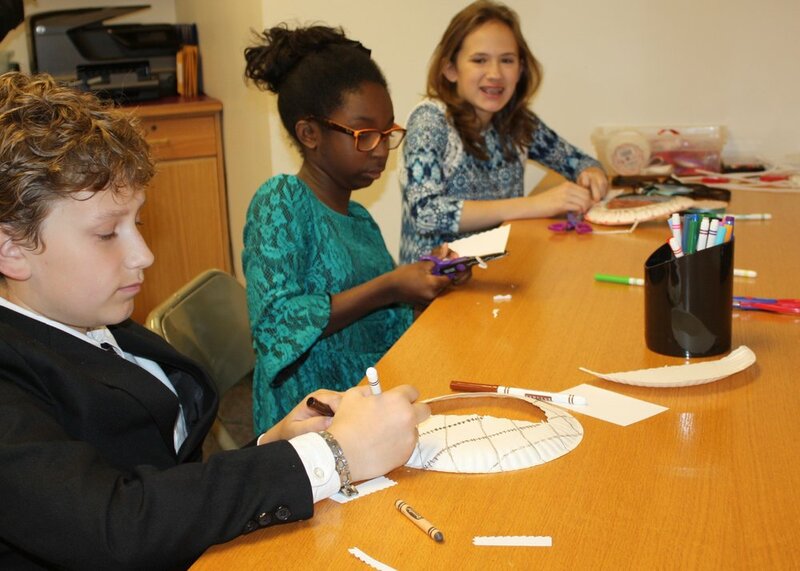 The children’s classes took turns visiting the Sabbath School resource room where supplies awaited them to create May Baskets with scriptures and messages of Jesus’ love. While the students were busy crafting May Baskets each class was read a story telling of children who surprised neighbors with good deeds. 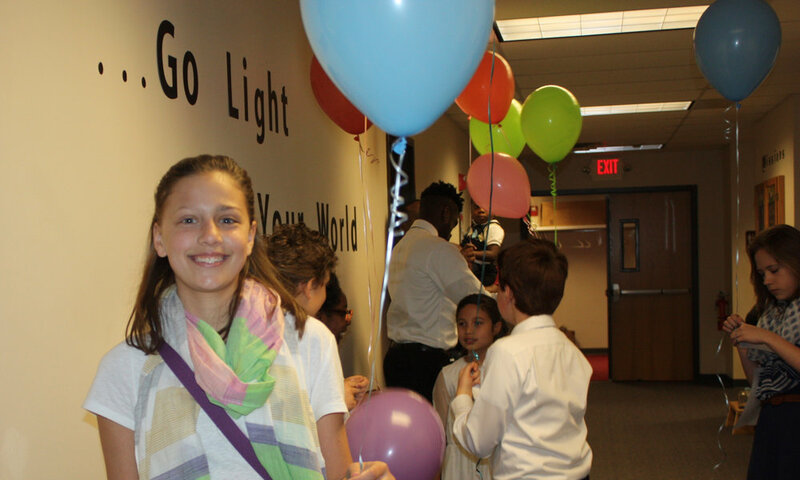 For second quarter our Children’s Sabbath School is focusing on “Go Light Your World”. 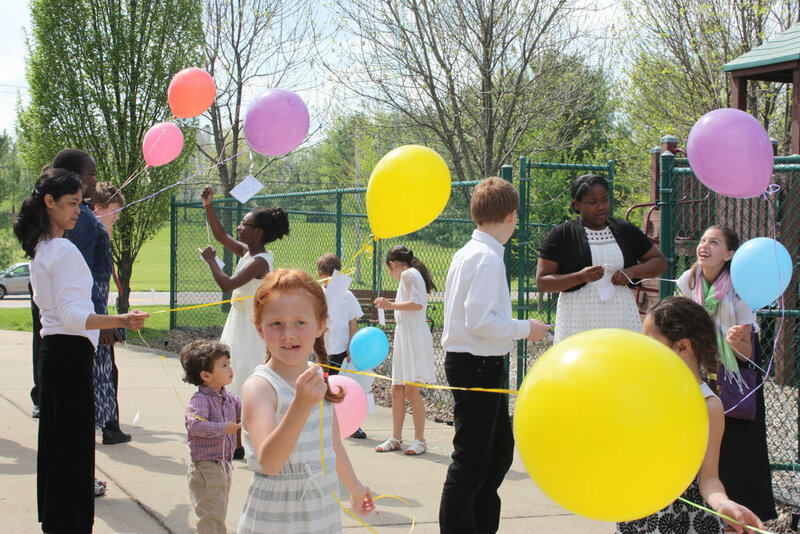 For Easter weekend everyone wrote favorite Bible scriptures on Jesus’ resurrection and then attached these scriptures to balloons. 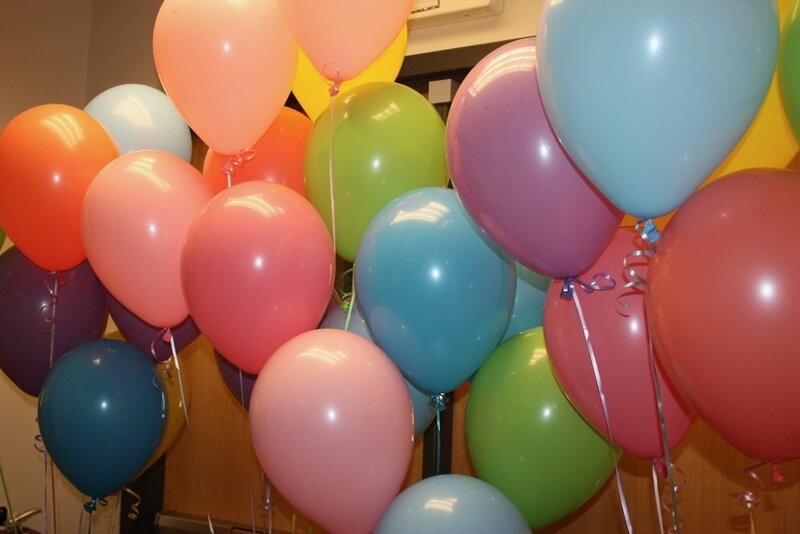 The balloons were then released. Our church embraced the theme, “He is Risen” during Easter weekend, April 15. 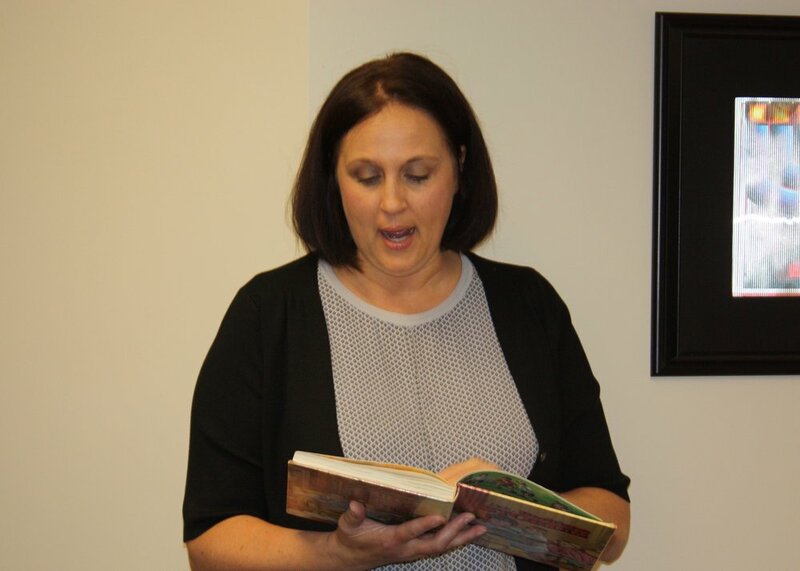 A special appreciation to our Choir Director, Charito Pattichot, who coordinated and directed an outstanding musical program. 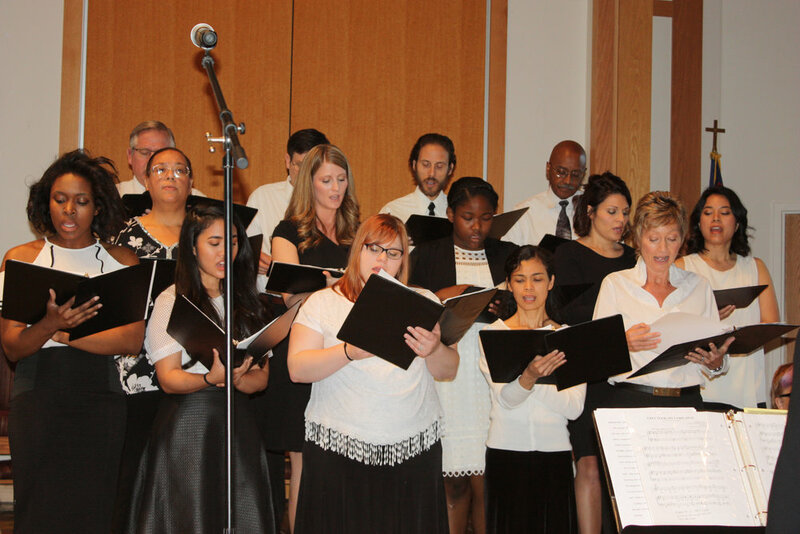 The selection of songs had not only lovely arrangements but were also rich with meaningful lyrics telling the story of Jesus' triumphant entry to Jerusalem, His feelings of isolation in Gethsemane, Mary's grief when witnessing the death of her Son, the sorrow of Jesus' followers when they laid Him in the tomb, and the culmination of Jesus resurrection and the gift it is to all! Nancy Cowin did an outstanding job as pianist. 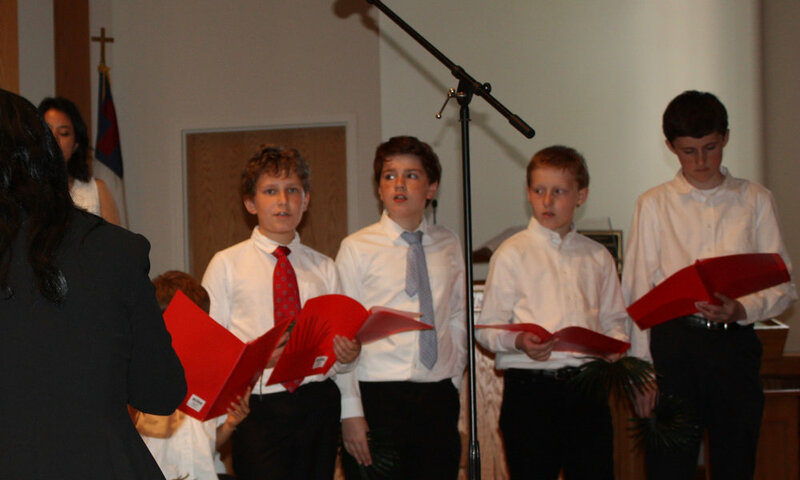 The church also enjoyed pieces that featured the children’s choir and instrumental accompaniment of the guitar, violin, cello and drum. Pastor David Klinedinst did an excellent job reading the narration that took the church through the Easter story. Following the service refreshments and a lovely luncheon were provided. Come visit the Children’s Sabbath School wing and check out the two Mission Bulletin Boards! 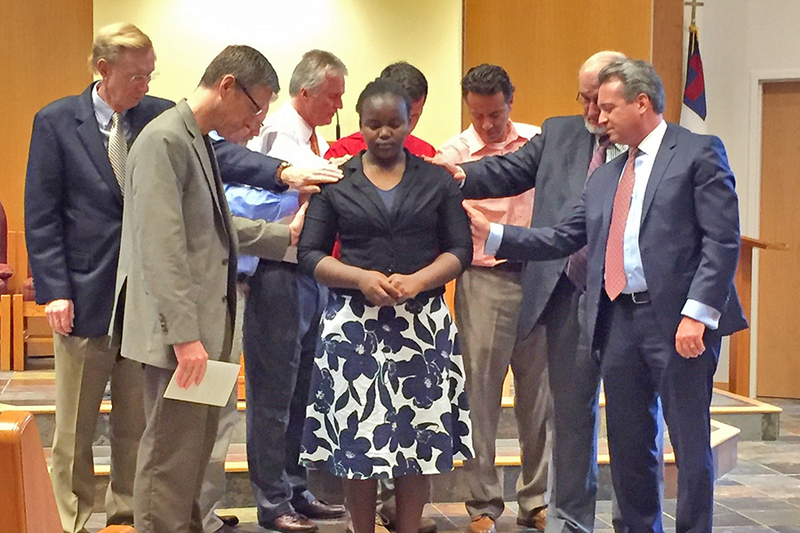 The Mission focus for second quarter is West Central Africa. One feature of the display is colorful flags. Test your skill at identifying which flag is for which country. Lauris White has been creating beautiful mission displays for the children’s mission offerings. This quarter she crocheted, in 3D, four adorable animals of Africa; a crocodile, an elephant, a monkey and a lion. Lauris’ display also tells where the mission offering goes to for this quarter. Children are given stones to place in the collection jar in exchange for any offering brought to their class. The Blue stones are for the Beginner & Kindergarten Classes, Red stones are for Primary, Yellow stones are for Juniors and green stones are for the Teen & Youth Classes.